So you have landed yourself an invitation to a Gujarati wedding? Well, we couldn’t be more jealous! 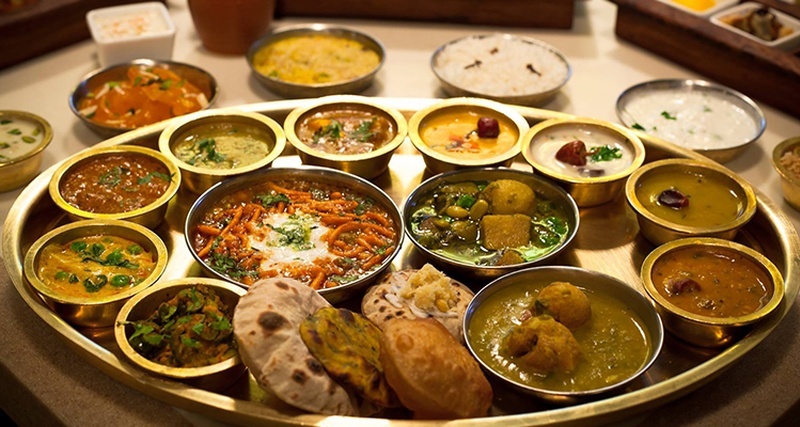 TBH, we are jealous about anyone who gets to gorge on an Indian wedding feast! After all, who wouldn’t love to enjoy a lip-smacking, drool-inducing wedding feast comprising of the region’s best food? Gujarati weddings are known for their love of bright colours and fun rituals and their food complements it beautifully. Nothing like digging into farsans and polishing off a grand feast with some delicious mithais! *sigh* Before we head off to grab a Gujarati thali, we bring to you the best of Gujarati wedding food that you absolutely cannot miss! This steamed delicacy is as healthy as it is delicious! It is best served fresh and we recommend a live counter if you are planning to serve this at your wedding. It can be tempered with mustard seeds and curry leaves just before serving. You can pair it with an assortment of chutneys for various flavours. For a modern twist, steam it in cupcake pans and served with grated cheese or tartar sauce. This spicy-sweet treat is a must-have Gujarati wedding food and we just love the flavours on this one! The steamed leaves with gram flour filling are a sublime combination of crunchy and melt-in-your-mouth texture. You can serve this with an assortment of dips and garnish with grated coconut for added sweetness ☺. The Gujaratis sure know how to combine soul food with the festivities. Kadhi, the yogurt based gravy, is a saviour for summer weddings. This light yet delicious Gujarati dish can be served with khichdi or steamed rice and is a winner all the way! Delving into this heavenly kachori makes us delve into a daydream. This deep-fried-goodness is filled with a green peas mixture and the softness of the peas and the crunch of the kachori are a match made in food-heaven. This is a wonderful addition to a winter Gujarati wedding. You can enjoy it with a sweet and sour dip (made of tamarind and jaggery) or you can re-invent the dish by serving it with a savoury curry. Any Gujarati wedding feast in incomplete without this traditional Gujarati dish. This mixed veg dish can be served with an assortment of breads and rice dishes. However, if you are serving this at the wedding, it is best paired with garma garam pooris. This spicy potato curry is a staple in every Gujarati thali and is a must have at Gujarati weddings. You can enjoy this versatile dish with both rice and bread and it is simply perfect for winter wedding as it packs a punch. It’s crispy. It’s crunchy. It’s yummy. It’s everything we have ever craved for especially with some gorgeous rice and lentil soup (dal, you silly! Just being fancy ;)). The okra is stuffed with spices and it is deep fried for a delicious main course that doubles as an appetizer. This lip-smacking dish needs no special note except that make in plenty in case you run out! This is as delicious as it gets and nothing like good old dal and rice to end a feast comprising of chaat and other farsans. There is no dearth of variety when it comes to dals and the special Gujarati dal is sure to impress our guests. You can serve it throughout the year, making it a staple at Gujarati weddings. We can’t even begin to tell you how much we love this dessert! It’s everything you look for in a dessert – rich, creamy, sweet and an aftertaste that lingers on and reminds you of the beauty that is shrikhand (It has the ability to turn people into poets!). With a texture very similar to ice cream, this gorgeous dessert can be topped with dry fruits, fresh fruits, chocolate shavings and so much more!